What is possessive aggression and how is it treated? Possessive aggression is aggression that is directed towards humans or other pets that approach the dog when it is in possession of something that is highly desirable, such as a favorite chew toy, food, or treat. "Protecting possessions may be necessary if an animal is to survive and thrive in the wild." While protecting possessions may be necessary if an animal is to survive and thrive in the wild, it is unacceptable when directed toward people or other pets in a household. What can be confusing for some owners is that it is not always food that brings out the most protective displays. Novel and highly desirable objects, such as a tissue that has been stolen from a garbage can, a favorite toy, human food, or a piece of rawhide are some of the items that dogs may aggressively protect. How can possessive aggression be prevented? Teaching puppies when they are young that handling their food and possessions results in good outcomes can help deter possessive behavior. If a puppy is eating, calmly approaching and talking softly while perhaps petting and dropping delectable food treats into the bowl may help some puppies learn that your approach is non-threatening. Once they are comfortable with this type of approach, you can gently restrain the puppy and remove the bowl, then praise the puppy and promptly return the bowl. You can follow a similar pattern while a puppy is playing with its toys. Approaching calmly, offering a food reward and taking the possession, praising the puppy and returning the object teaches the puppy that your actions are not to be feared. Using a leash can help insure success at the outset with a minimum of confrontation (See our handout on 'Puppy – Handling and Food Bowl Exercises'). 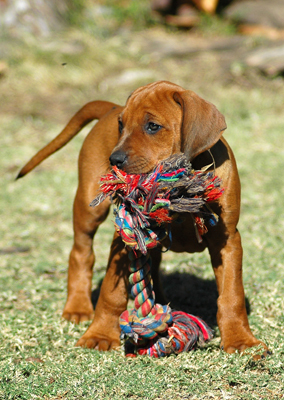 How can I treat my dog if he is possessive with objects and toys? It is important to prevent any possibility of injury when you begin treatment. At first it may be best to confine or supervise your dog so that it cannot gain access to any items that it might pick up and protect. Blocking off areas so that the dog does not have access to certain items might also be necessary. 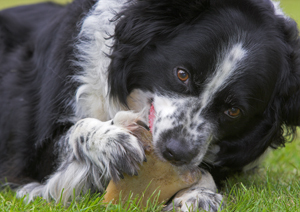 Dogs that protect their treats or toys should have them taken away, and only allowed access to them when alone in the crate or confinement room. In fact, by giving these items exclusively in your pet's confinement area, your dog may learn to be more comfortable resting and relaxing in this area since it is a place where chew toys are given and where the dog is left alone. Highly valued items (e.g. the ones the dog is most likely to protect) such as rawhide bones, pig's ears, etc. should not be given to the dog at all during this initial training period. Of course, if there are items that your dog might steal and then protect, you should keep them out of the dog's reach by using sealed containers, or keeping them behind closed doors or high enough that the dog cannot reach. To prevent stealing and to teach leave, you should keep your dog supervised with a long leash attached to a head collar so that your dog can be prevented from wandering off, and immediately interrupted if it attempts to raid a garbage can or pick up inappropriate objects (See our handout on stealing and teaching give). Booby-traps (Snappy TrainersTM, motion detectors, unpleasant tastes) can also be used to teach your dog to stay away from selected objects and areas (See our handouts on canine punishment and behavior products). Dogs that protect their food can be given a less palatable diet, and fed in a separate room away from family members. "The goal is to teach the dog that it will receive a favored treat or reward that is even more appealing than the object in its possession." Although prevention can help to ensure safety, if you are to correct the problem, you will need to teach your dog to accept approaches and give up objects on command. The goal is to teach the dog that it will receive a favored treat or reward that is even more appealing than the object in its possession. For details, see 'Puppy – Handling and Food Bowl Exercises' handout and in our handout on 'Training Dogs – Teaching Give and Drop'.However, you must first have good control and a well-trained dog. If your dog will not sit and stay, come, or allow approach when it has no object in its possession, then there is little chance of correcting a possessive problem. If the dog already has the item, he will need to have been taught a "give" or "drop it" command that tells him to give up the object for a reward. However, this needs to be part of a training program where your dog is taught to drop objects of low value and reinforced with rewards of much higher value. Even if your pet learns to drop on cue, this does nothing to prevent stealing. It might also be possible to train your dog to "leave" items and not pick them up again if you can effectively supervise. For details, please see our handouts on 'Training Dogs – Teaching Give and Drop' and 'Training Dogs – Stealing and Stay Away'. Usually my dog knows "drop it" or "leave it" but for some really valuable items he just won't comply. What's next? For some dogs, a diversion with something else they really want to do will result in them leaving an object. This may be a walk, a ride in the car, ringing the doorbell etc. If you offer the dog an alternative activity, you must follow through, even if it is short. In some situations, this may not work or be appropriate. "Only the adult that has the most control over the dog, never children, should attempt this exercise." For example, you may need to trade for stolen items of value or for those that are dangerous to the pet; these items need to be retrieved quickly before they are damaged or the pet is injured. Only the adult that has the most control over the dog, never children, should attempt this exercise. When the dog has the stolen item, the owner goes and gets a highly valued food reward that the dog reliably wants. Then the food reward is shown to the dog from 5-6 feet away and the dog is called to "come". When the dog leaves the item, the owner backs up and calls the dog again and adds, "sit". This is repeated 2-3 times without giving the dog the food reward until he is at least 15-20 feet from the object (preferably in another room). The dog is then given the food, gently taken by the collar (if he will reliably allow that), and put outside or into another room with a closed door. Only at that time does the owner retrieve the item. The exchange NEVER takes place right in front of the dog and the item. If, at any time, the dog shows aggression such as growling, snarling (lifting the lips), snapping, lunging or biting, leave the area immediately and do not attempt to take the item from the dog. This problem is dangerous and serious and requires the intervention of a veterinary behaviorist.